by Pepe Escobar (cross-posted with the Strategic Culture Foundation) by special agreement with the author) The Made by FBI indictment of Julian Assange does look like a dead man walking. No evidence. Bríd Smith said today that the nurses’ dispute was not simply a pay dispute, but was about the kind of health service we want in the future. Speaking in advance of Dáil debate on the nurses dispute today, she said the Solidarity People Before Profit amendment to a Fianna Fail motion gave all TDs the opportunity to clearly support the central issue of the dispute; the demand by nurses and midwives for pay parity with other similar qualified health care professionals. 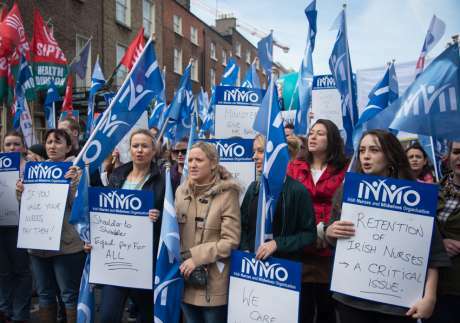 The amendment calls for the Government to immediately enter negotiations with the INMO and PNA to resolve the dispute and to allocate sufficient funding this year to meet the pay increase. She said: “We have 1000 vacancies on the public system, only 1 applicant for every 4 jobs and huge numbers of our newly qualified nurses are leaving the country and the public service. That these facts are disputed by the Government speaks to their ability to ignore the reality of a crisis-ridden public health system. “We call on all TDs to support the nurses and send the message that we understand we can’t have a decent health system if we don’t retain and recruit and justly reward the nurses at the centre of that system.